Despite the fact that boys tend to need no help making noise, I wholeheartedly concur. Guys Read: Thriller is the second volume of the Guys Read Library, following the excellent Guys Read: Funny Business. These books (sports and nonfiction are upcoming subjects) are compilations of short stories from a variety of authors who all share one common trait: Boys read what these authors write. “Why is that shady-looking character lurking in the dark alley? What’s he doing with that crowbar? Is that something in his other hand? What is he doing? What has he done? 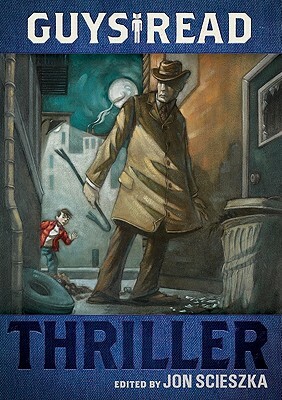 Guys Read: Thriller is full of the mysterious. There are ghosts and haunted houses. There are wishes that come true and a bumbling detective. There are pukwudgies, pirates, a missing copperhead snake, and a body on the train tracks. In other words, there’s everything a guy might want in a thrilling book. It’s good advice. Get the book. Get reading. And move quickly, before the guy in the alley sees you. The first book in the Guys Read Library had a great video introduction featuring all of the book’s authors. No such luck this time, but I did find this little gem on YouTube. Enjoy!